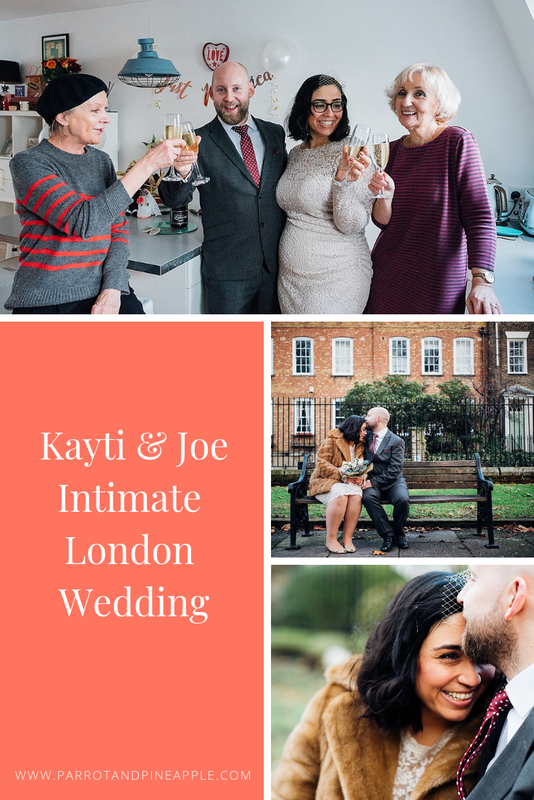 Kayti and Joe met at a big wedding, but opted for a very intimate London wedding to formalise their relationship. They didn’t tell anyone what they were planning, they just invited their mums over to stay and told them that morning what they had planned for the day! The element of surprise definitely added to the fun and romance. 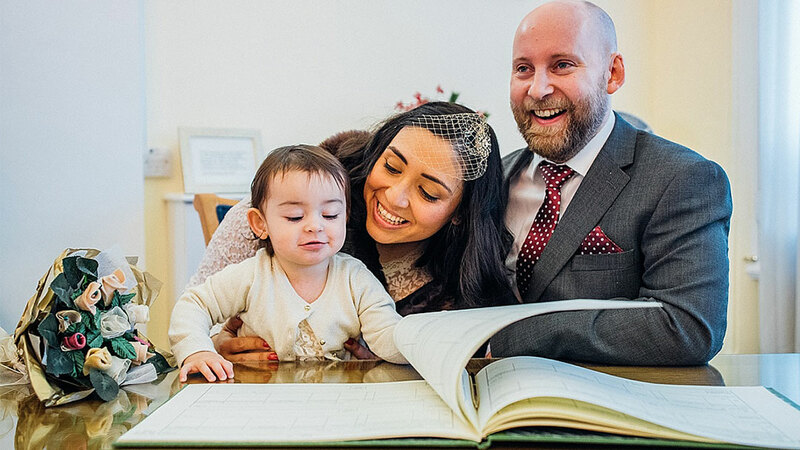 Why did you choose Tower Hamlets Registry office? Tower Hamlets Registry Office is down the road from our flat and it’s where our daughter was registered. 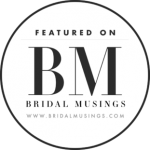 With this being a secret low-key wedding we wanted somewhere that had sentimental value. We met at a wedding! Kayti was best friend to the bride and the most drunken bridesmaid ever! Joe was friends with the groom and wasn’t exactly sober either. Neither of us remember much from that night, but tried to piece it together in the pub the following weekend. There was no proposal! 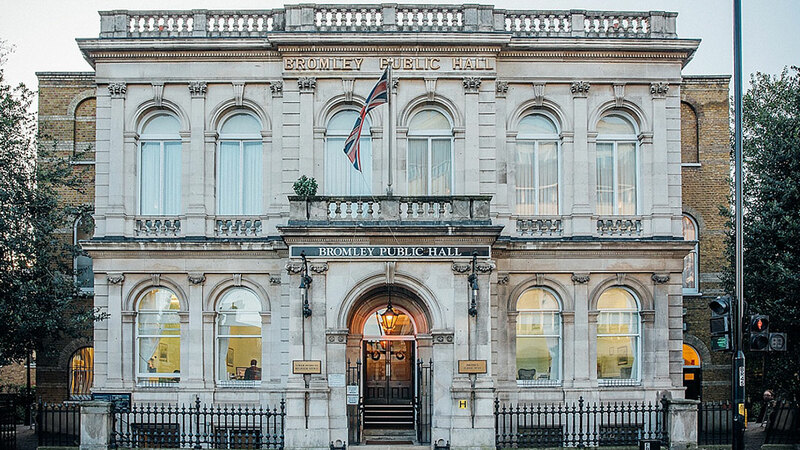 We booked an appointment with the Registrar to see how we go about getting married – next thing we know, we’d booked a ceremony for 29 days later! 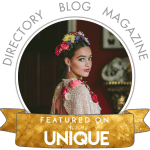 Did you want any particular style for your intimate London wedding? 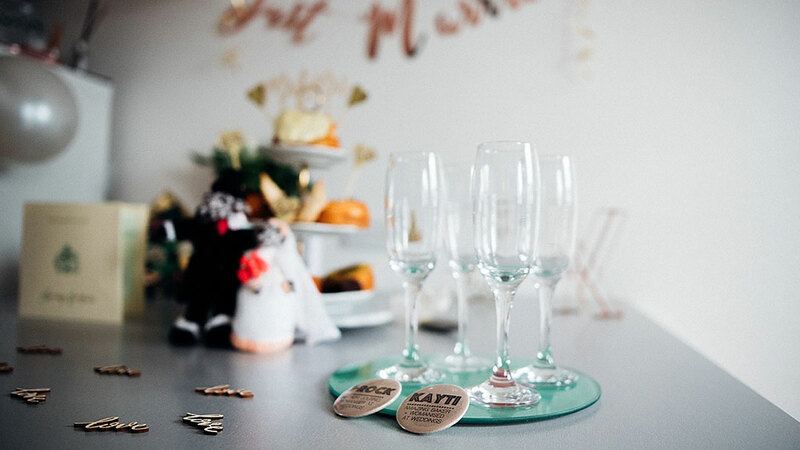 There wasn’t a theme as such – but the styling was quite vintage. Kayti’s a big fan of a brooch, and had a lovely vintage one her Nan left her and also wore a similar one from Joe’s Granny. 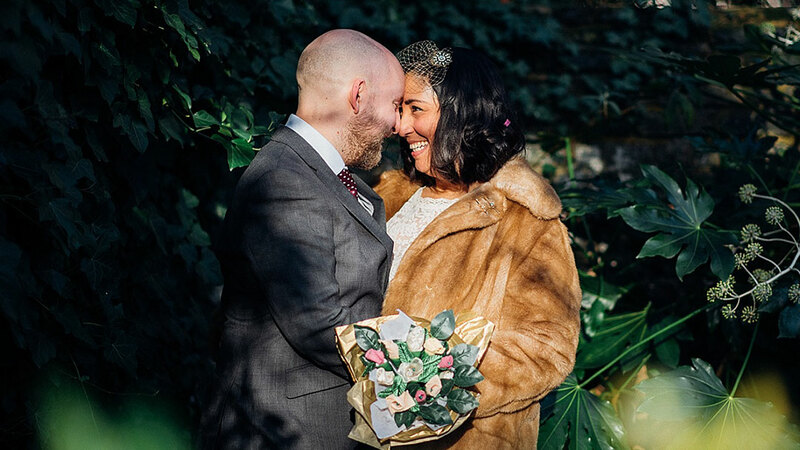 A winter wedding, close to Christmas – meant we could go big on furs, gold and glitter! 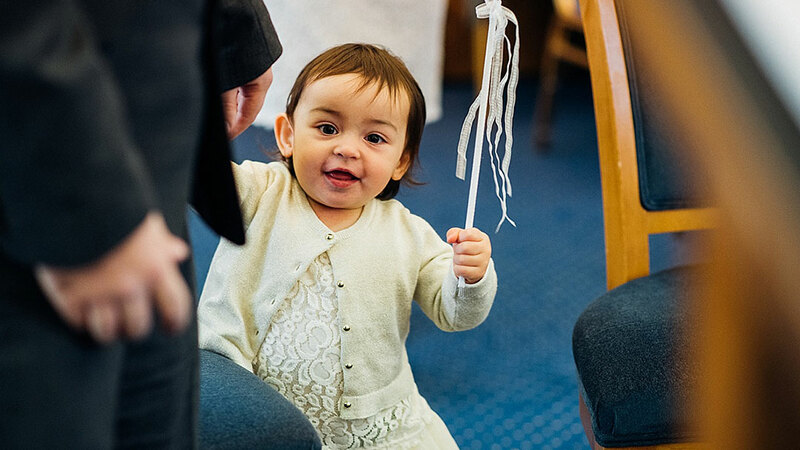 The flowers were recycled from a baby gift we got when Esme was born – a bouquet of bibs! Brown felt and gold ribbon were used to make the “petals” and wrapped in gold tissue paper. 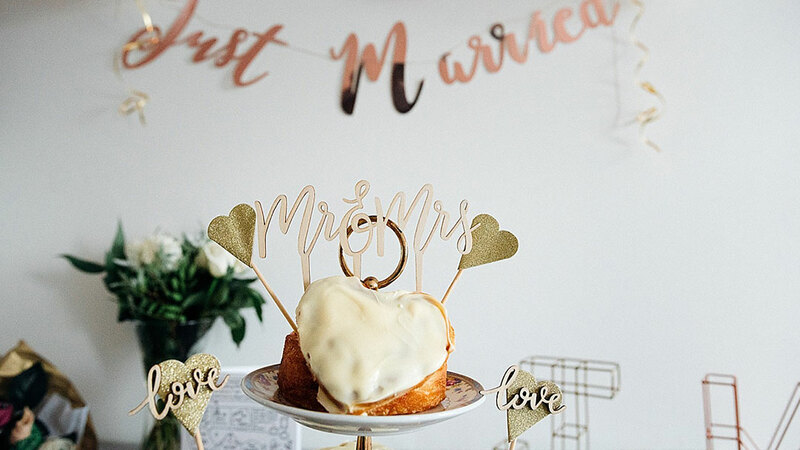 Our wedding cake was a selection of our favourite cakes and cronuts were displayed on a beautiful vintage cake stand we’d had for years and never used! 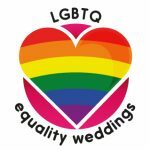 What did you plan for your ceremony? Like us, the ceremony, was laid back, stress-free and relaxed. We decided not to tell anyone and just invited our Mums – who were our witnesses. 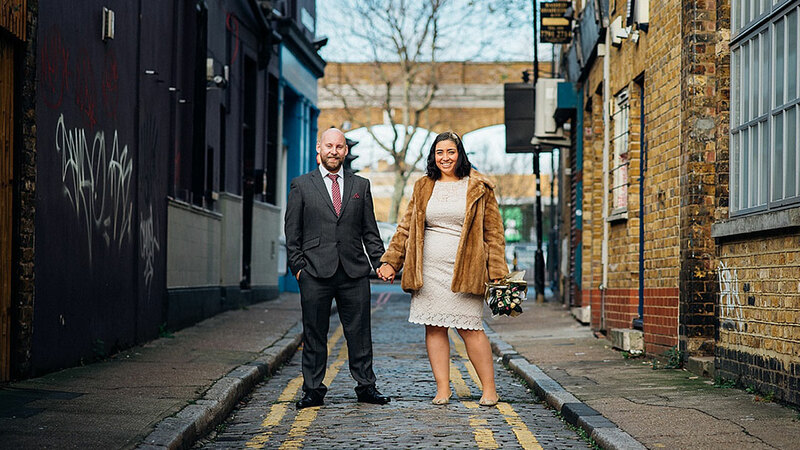 Joe told his Mum a few weeks before the wedding to book her in, but Kayti was a bit more sneaky – she got her Mum down to London on false pretences and didn’t tell her till she was here. As the wedding was so close to Christmas, we knew we’d be seeing lots of family and friends over the festive period, so knew we’d have chance to celebrate with everyone. We loved how relaxed the ceremony was – neither of us felt nervous at all and could just be ourselves. We had no readings – the ceremony was short and sweet (like Joe!). The favourite bit for both of us was our daughter breaking into song half way through our vows! Did you have any music? We are both music fans so went big on the tunes. Whilst the guests were waiting for the ceremony to start we played Be my Baby by the Ronnettes – this was Joe’s late father’s favourite song. 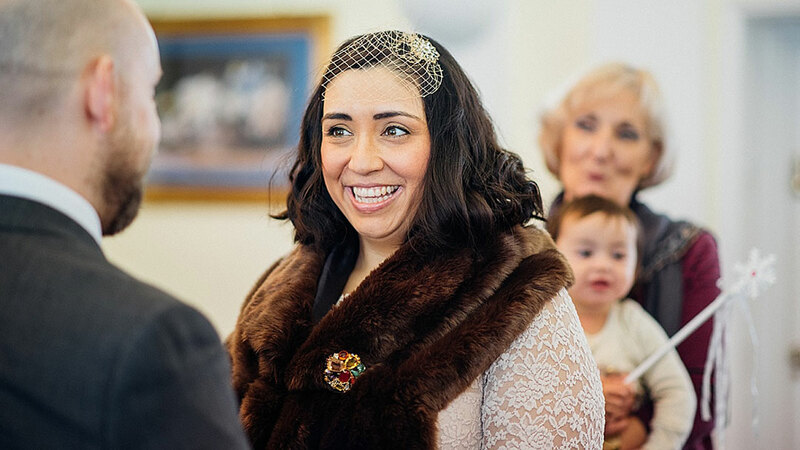 Kayti walked down the aisle to You’re So Cool from the film True Romance, a film we are both a big fan of. We signed the register to our song – one of the lesser known David Bowie hits – Absolute Beginners. 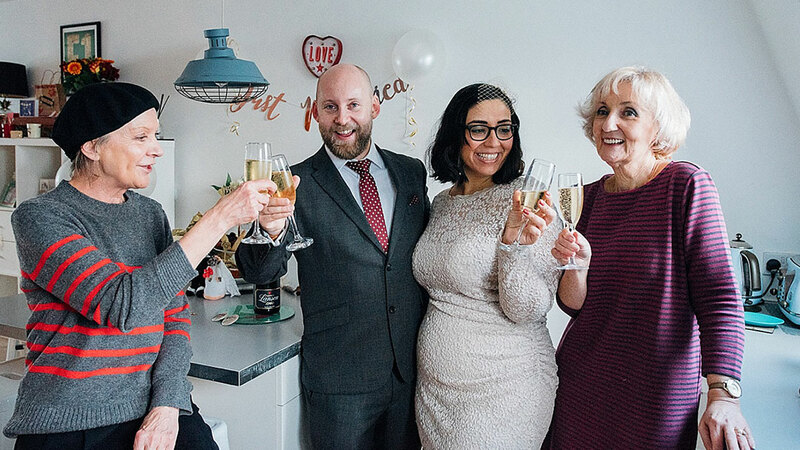 After the ceremony, we went back to our flat for cake cutting and champagne drinking before we went out for lunch. 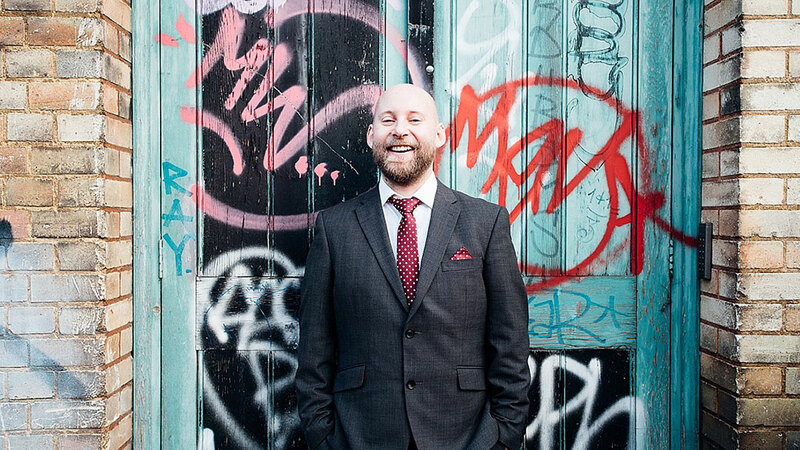 Joe was in charge of the music and did a cracking play list – which included some of our favourite songs, to name a few – Pulp – Something Changes, Hot Chip – One Life Stand and The White Stripes – Hotel Yorba (our daughter’s favourite song!). 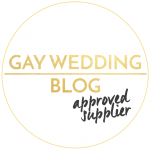 Would you do anything differently to your intimate London wedding? We wouldn’t do anything differently! We loved it! There was no compromising, no arguments, no worrying about budget…and this was all because we kept it a secret and had no guests. For us both we wanted the day to be special, but our main objective was just to be married. It was about us and no one else. We appreciate it’s not for everyone and would hate to encourage any family arguments, but this suited us and we wouldn’t change a thing! We knew from the get go we would blow most of the budget on a photographer. 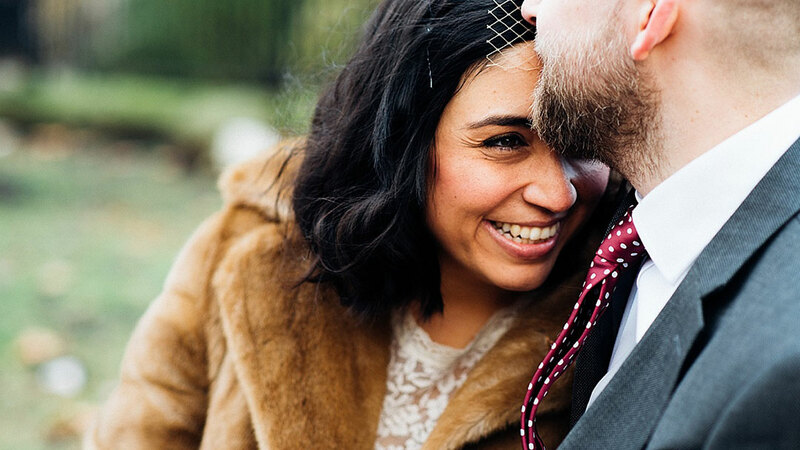 We contacted the photographer who our friends used at their wedding (the one we met at), but unfortunately she wasn’t free that day and recommended Rowan. We took one look at her website and knew she was the photographer for us! She was a pleasure to work with – given there were only five of us at the wedding, we were worried it might be a bit awkward with a stranger there. But there was no need to worry – we all totally fell in love with her. She was brilliant to work with – she even managed to take photos of our daughter actually looking at the camera – something we’ve failed to do for 15 months. And my god – she made us look so cool! 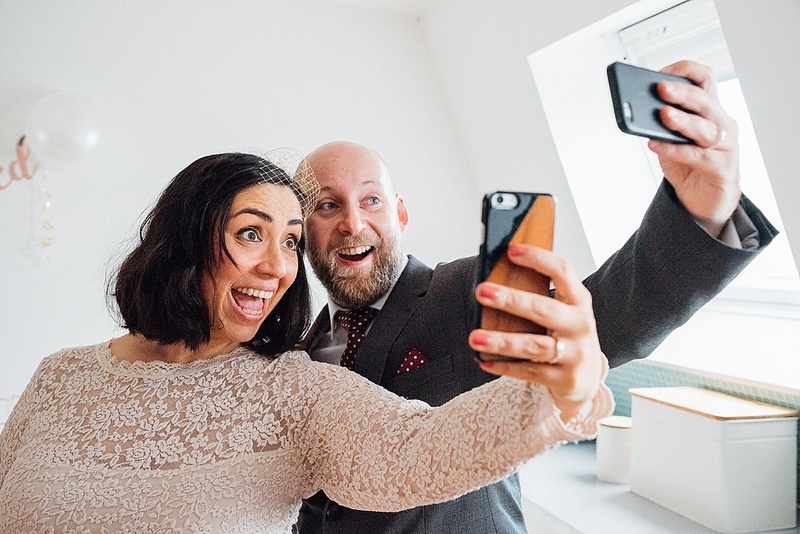 We are both really pleased with every photograph – we think the photos were even more important to us – not only something to remind us of our special day, but because we decided on a secret wedding – something to share with all our friends and family so they could see what we got up to.